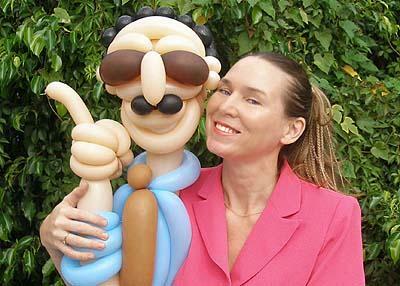 Irina Patterson is the "Russian Queen of Balloons", a balloon artist who creates caricatures, animal figures and other fun items for the enjoyment and entertainment of people at parties. Read about her interesting experiences and get some insight on what it is like to work as a balloon artist. Earlier in your career, you were an emergency room physician working out of Izhevsk, Russia. What inspired you to move to the United States and become a balloon artist? What inspired me to come to the United States? It is more like whom than what. It was my husband, an American poet and psychologist, Wes Patterson. I met him through a correspondence magazine. I came because he wanted me to come and marry him. In his letters he claimed that his being a psychologist with degree from Johns Hopkins University qualifies him to see that we are a perfect match. Can you believe that? Me neither. I came to Miami in July of 1992, a month before Hurricane Andrew hit South Florida in August. We did get married shortly thereafter. 15 years later we are still married. My husband was right. We were and still are a perfect match. I became a balloon artist much later. It happened by accident. First, let me say, growing up in the Soviet Russia in the seventies, I've never seen a balloon animal. There was no such thing in my childhood. Blame it on the Cold War or Iron Curtain, but there were no balloon animals in my childhood. Maybe Apparatchiks kids or Kremlin kids or other privileged kids in Moscow were exposed to balloon animals and other corrupting influences of the West. But poor little me growing-up in the Ural Mountains of Russia, in the city of Izhevsk, the hometown of Michail Kalashnikov the inventor of the Kalashnikov assault rifle, I didn't see any. Nor did I see any balloon animals while I was living in Miami for the first 13 years. I don't have kids. I didn't go to kids parties. I didn't go to the malls. By the way, I see balloon animals now all the time. Why didn't I see them before? I just wasn't aware they existed. I had balloon animal blindness, if you will. Don't laugh. It happens all the time. People look but they don't see unless they pay attention. But, let's get back to that fateful day when I did see my first balloon animal at a private party. I was 43 years old already, for God's Sake. It was a simple balloon dog, nothing fancy. But I was awestruck. I was ecstatic. I saw something that awakened a dormant artist in me. I was completely blown away. I later went to a local balloon wholesale store and discovered that balloons come in all kinds of twisty shapes and colors. That was the day the "Russian Queen of Balloons" was born. Your balloon art creations are very unique and beautiful in design. What is the most elaborate object you have ever made? I like making people, caricatures of celebrities or characters that can be recognized, Paris Hilton, Shaquille O'Neal, Harry Potter, Darth Vader. I am also known for making fashion outfits out of balloons that I then model myself. I have a latent fashion designer in me as well. What are some of your most difficult challenges when working with balloons? One challenge I have is to explain to people who haven't seen me performing what I do. Until people actually see me twisting balloon art at events, they don't really believe the impact that it has on the audience. As one woman put it, "It is the whole package: the dress, the personality, the interaction and then the balloon art itself." The stereotype of a balloon artist is a kid's party clown who twists balloon doggies. I am trying to change the stereotype. Your unique talent has given you the opportunity to entertain people from all walks of life. Who are some of the most interesting people you have met? Recently, I entertained at a private party of Denyce Graves on Fisher Island. It was exactly my audience: a sophisticated, cosmopolitan crowd that loves and understands art. We connected on every level. Denyce hugged and kissed me and thanked me numerous times. She even called me the next morning to thank me again. And she is a huge international star that brings Opera Houses worldwide to standing ovations. What an honor to be simply relevant to people like that! I met Shaquille O'Neal walking down the street in my neighborhood. Remember, this is Miami where Shaq is huge. People on the street just went silent and then began dialing their cell phones frantically to tell everyone that they just saw Shaq on the street. I had my portfolio of balloon sculptures with me and had my Shaq balloon sculpture in it. I calmly came up to him, pulled the Shaq sculpture photo out of my book and simply said, "Here, I made you." He said, "Love it. Will call you for a party." P. Diddy, another South Florida resident celebrity, once auctioned a party package with my balloon art entertainment for $35,000 while prancing with my balloon art on a stage at a fundraiser of Russell Simmons' Rush Philanthropic Arts Foundation at Donald Trump's Mar-a-Lago in Palm Beach. I also remember lots of wet slobbering kisses and hugs of many small children that just learned how to say 'I love you.' And those encounters are just as precious. People must ask you to create all sorts of interesting objects. What is the most unique item anyone has ever asked you to create? Shaquille O'Neal, Darth Vader and Paris Hilton. What are the most popular types of events you are asked to entertain for? Birthday parties from age 1 to 90. When you are hired to do these events, how do you work your rate, per hour/item, or a flat rate? I usually inform my clients about my hourly rate and depending on the number of hours and location of the event we then negotiate the best fee that makes everyone happy. As a balloon artist, how many parties/events do you entertain for per month on average? 12 as a minimum - usually more, much more during the Holiday season. LoveToKnow has heard that you also do balloon caricatures of people. Which presents a bigger challenge, men or women? Women require higher maintenance, of course. Their dresses and hair are more elaborate and they usually accessorized. But I don't view it as a challenge, really. It is fun! If someone were interested in becoming a balloon artist, what advice would you give them? Find someone who is a balloon artist entertainer and tag along for a while. It is the only way to check if this is something you want to do. Balloon art entertainment is all about people. Twisting balloon animals is the easy part. The truth is the quality of your balloon art is not that important. OK, you will get some extra points if you are a great artist. But it is your social skills and your ability to entertain that would build your business. You can master a few basic balloon dogs and other simple balloon art in an hour. And if you have some social skills, you are in business. It is up to you if you want to advance your balloon art skills from there on. If you are just interested in balloons without the entertainment part, I suggest you become a balloon art decorator. How to contact balloon artist Irina Patterson, the "Russian Queen of Balloons"